In terms of sowing conditions, no two years are the same. Every year, nature has a new surprise for farmers: one year it is dry with 5 cm of fine tilth on the surface. The following year it is dry but with rough clumps. A year later the soil is moist. That is why the power harrow has to be able to adapt to the prevailing site conditions. What is even more important is that the seed drill can be adapted. The seed drill in combination with the power harrow has to be able to handle all the requirements. With the LION power harrow, it is easy to quickly set the ideal working depth to obtain the correct seedbed structure. The working depth should not be deeper than the level at which the seed is placed. 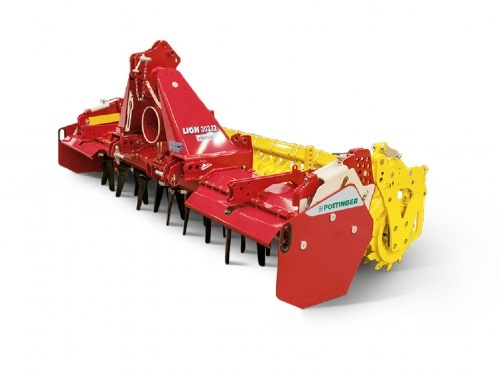 On LION power harrows the working depth is adjusted in 1 cm steps using a pin-in-hole system. Tractor horsepower continues to increase and driving speeds during seedbed preparation are also getting faster. As a result, the performance of the power harrow needs to match these increases. 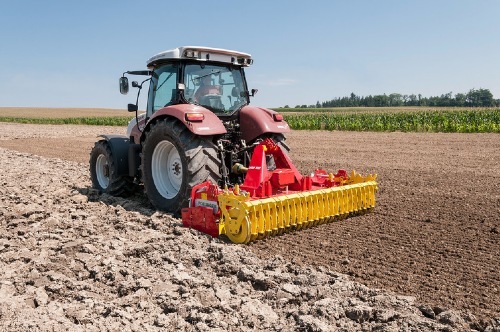 With its extensive range of products, Pöttinger has the answer: The Pöttinger range of LION power harrows has 3 series for the market: the LION CLASSIC, with a power rating of 140 hp, is ideal for 4-cylinder tractors. This machine is available in working widths of 2.5 and 3.0 metres. If several tractors are in use on the farm, then it would be a good idea to choose the next more powerful series, the LION 103. These achieve an optimum seedbed structure with 180 hp over a working width of 3 metres, and with 200 hp over widths of 3.5 and 4.0 metres. Above that there is then the LION 1002 series, which can be operated at up to 250 hp. Good interaction between the rotor tines is very important. For a working width of 3.0 metres, you can choose between 10 or 12 rotors. At higher power ranges and in stony regions, the versions with 10 rotors are recommended because the material thickness of the tines is increased to 18 mm.